Map of a proposed but never built canal connecting Tampa Bay and Lake George. Map Showing the Different Lines of Survey Across Florida for a Canal Between; Espiritu Santo bay and the St. Johns and Ocklawaha Rivers. This is an attractive example of the 1854 public survey map of Florida for the proposed canal across the espiritu Santo Bay and the St. Johns and Ocklawaha Rivers. This beautiful hand colored map covers Florida from Lake George in the north to Maniti River in the south and from Tampa Bay east as far as Lake Hamey. With the increase in population and the growing rise of Florida's agricultural industry, mostly through the introduction of slave labor, a canal was proposed to aid transportation of goods to and from central Florida. This map marks the proposed route of the canal along with survey lines and townships. Profiles showing the proposed levels of the canal route from Tampa Bay to the St. John's River are featured along the left margin of the map. Although surveyed and discussed thoroughout the 1840s and 1850s, various delays prevented it from being constructed. With the advent of the Great Age of Trains, a railroad was eventually constructed along the same route. The cartographer notes various forts, swamps, creeks, rivers, lakes, prairies, and various other topographical features in the area. Relief is shown in hachures. 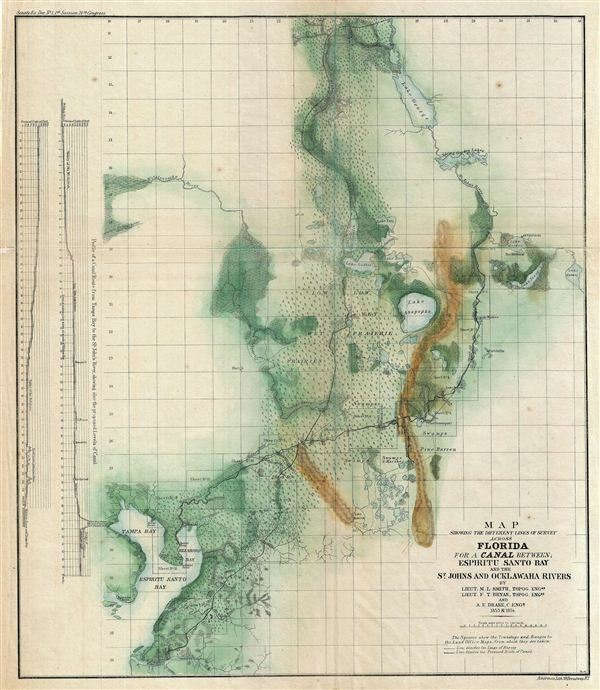 This map is printed by Ackerman and prepared by topographical engineers M. L. Smith and F. T. Bryan along with Army Corps of engineers specialist A. e. Drake. Very good. Original fold lines visible. Minor discoloration over fold lines. Blank on verso. Professionally flattened and backed with archival Japanese tissue. Servies, J. A., A Bibliography of West Florida, #3950, 4138.